If Eric Greitens sent you his résumé, you wouldn’t believe it. But maybe you have some time to kill and figure why not call him up, go to his home in Missouri, and catch him in a lie. "Very impressive resume, Mr. Greitens. A Navy SEAL and a Rhodes Scholar? Sure buddy, and I’m Mother Teresa … oh, so now you’ve worked with Mother Teresa …"
The conversation could go on like this for hours. You’d hear how he spent his Duke University years tending to victims of poverty and genocide from Calcutta to Rwanda, that after Oxford he turned down his ticket to the One Percent to become a SEAL to live out his humanitarianism-through-strength dissertation thesis, that he lived off an air mattress to start a non-profit helping wounded veterans. He’d tell you that Fortune Magazine named him one of the 50 greatest leaders in the world, that Time Magazine said he’s one of the 100 most influential, that he’s only 40 years old. By the end of the conversation, you’d fly down to St. Louis to see if he’s lying when he says he’s a golden gloves champ, too. You would then find yourself in the library. Winslow Homer’s The Veteran in a New Field hangs above the collected works of Winston Churchill at the center of the room. Neatly folded Navy fatigues sit to the left. There are six bookcases; a third of them dedicated to philosophy. The philosophizing happens in the basement where Greitens begins his mornings. There’s a heavybag, kicking dummy, about 150 square feet of martial arts mats, and a stocky St. Louis fire captain stretching out by the free weights. The workout begins with warm-up squats that will top out at 200-plus pounds, followed by pull-ups in 60-pound vests, five-station interval training, heavy bag sessions, and several rounds of tae kwon do pad work up and down the mats. The routine usually takes 75 minutes, but on this frigid Wednesday Greitens and Capt. Gregg Favre are carrying an extra 180 pounds of deadweight and lactic acid in the form of a Washington Free Beacon writer. Greitens’ humanitarian background is on display at all times over the 90-minute workout. "As long as people are exercising and getting healthy, I’m happy," he says as I struggle to touch my toes. "Bill did his bodyweight," Favre calls out, leading to an exuberant "way to go Bill" from the veteran who can squat 170 pounds 52 times without stopping. After struggling to do my third chin-up, Favre takes hold of my feet, allowing me to do a set of ten. "I was just steadying you, only lifting like 20 percent," he says. "We’re just making sure you’re not wasting energy on swinging," Greitens says. "It was more like 15 percent." "Feel free to write whatever you want. We’ll back you up." The workout felt more like a new age therapy session than Hell Week at Coronado Beach. Favre has been doing this with Greitens for six years now. Several of his buddies came back from Iraq and Afghanistan with PTSD, and when Favre heard about Greitens’ organization, The Mission Continues, he gave up his career as a fireman to help get it off the ground. He spent two years at the SEAL’s side before returning to the fire department as head of the homeland security division. The workouts continued. I ask him if the nice-guy routine is just a show for the reporter. "No, that’s Eric. What you see is what you get," Favre says. The pair can accept that a hungover reporter will give up on the third chin-up, but they are unforgiving toward one another for the simple reason that the public depends on them. "This [training] program is what I need to be ready. I know things can’t always go my way, but I don’t want them to not go my way because I’m mentally or physically unprepared," Favre says. We take turns on the heavy bag. Greitens won gold at the British university championships while at Oxford. He doesn’t seem like a knockout fighter until you’re holding the bag, and he’s dancing circles around you, peppering it with combinations. "Eric, can you ease up on the punching? You woke up the baby." Sheena Greitens stands on the landing with six-month-old Joshua. She’s an assistant professor at the University of Missouri specializing in East Asian politics. She did her Harvard dissertation on authoritarian regimes and met Greitens after he gave a lecture on leadership (and toppling authoritarian regimes) in 2009. "She came up afterward, and I asked her if she wanted to grab a hot chocolate. By the end of the night I knew I wanted to marry her. That was 2009. We’ve been married three years," he says. The Boy Scout behavior belies Greitens’ attitude on the battlefield. "I really appreciated having his trigger by my side in Fallujah," says Marine Lt. Col. Joel Poudrier. Poudrier served with Greitens at the height of the insurgency in 2007. He was a major in a Marine Military Transition Team (MiTT) tasked with training Iraqi soldiers when he met the SEAL. Greitens’ only job was to exchange intelligence, but he jumped at the chance to go out on missions into the notorious city’s neighborhoods. "He was the only SEAL that integrated with us. Marines and SEALs both like to be close to the action. It’s a natural habitat and Eric was a real pro," Poudrier says. While most Marines stayed at U.S. bases in the outskirts of the city, MiTT officers stayed at Iraqi installations in Fallujah to quickly respond to violence. Greitens chose to remain with them, which is why he was next to Poudrier when the wall fell on the Marine’s head. Two suicide bombers detonated a truck laden with chlorine next to their beds collapsing a quarter of the building. Then the AK-47s opened fire. The SEAL, near-blind and unable to breathe, instinctively headed to the roof to ward off a follow-up attack. "I don’t remember much, but I know after the explosion he went on the roof of the building to provide overwatch and help medevacs take people like me out," Poudrier says. 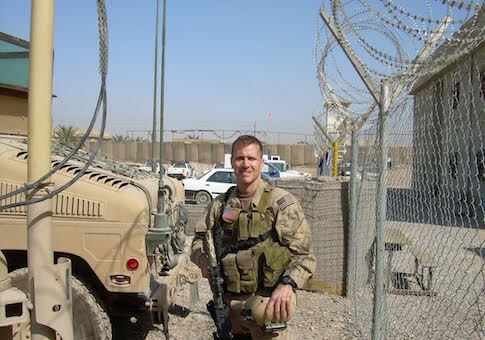 Greitens won a Purple Heart and Bronze Star for his actions on tour. He remains a Lieutenant Commander in the Navy Reserves and spends one weekend a month training with an expeditionary strike force. Greitens will be busy over the next few months after Resilience, a book of letters he wrote to a SEAL comrade afflicted with PTSD, debuts on March 10. For now he fills his time on the speakers circuit where Navy SEALs are in high demand. As committed to the job as he is, one gets the sense that Greitens is looking for his next challenge. Rather than wasting his midlife crisis on a sports car—he still drives the white Ford Ranger he purchased when he finished SEAL training—he plans to make a political run in 2016. "The more SEALs, Marines, and special operators in office, the better. They know how to put country first. They know how to serve something much larger than yourself," he says. He doesn’t plan on following in the footsteps of freshman Rep. Ryan Zinke, the retired SEAL commander who once kicked the crap out of Greitens’ training class because one member forgot to wear a belt. "I’m looking at something in the executive branch where I can lead and actually make a difference, governor or lieutenant governor," he says. He will run as a Republican in a state that re-elected Democratic Gov. Jay Nixon by 12 points in 2012. Nixon’s bungled handling of the Ferguson riots last year caused a slide in the polls. He contrasts Nixon’s delayed deployment of the National Guard with the proactive approach that Favre and St. Louis officials took to head off rioting in the city even as the county burned. He doesn’t bring up the riots to score cheap political points; it arises naturally during a discussion on classical philosophy and the need for leaders to develop practical knowledge. "People saw that the lack of leadership has real life consequences. It’s easy to lead when things are good. Leadership is what you do when things turn bad," he says. Greitens has spent the past year meeting with leaders he admires to learn what makes them tick. He sat down with Burl Cain, the diminutive warden who transformed Angola Prison from a tortuous Dante-esque hellhole into a place of redemption, winning the respect of guards by charging into uprisings with a shotgun and prisoners by holding the hands of the condemned as they took their final breaths. He toured charter schools in New Orleans and travelled Missouri meeting community leaders to "learn how to actually improve people’s lives." "A mechanic doesn’t get to know an engine by reading books on it. He goes in there and gets his hands dirty. I wanted to know about agriculture in Missouri. I didn’t meet with a lobbyist. I went to a hog farm and learned from a hog farmer what it takes to succeed," he says. "Wisdom doesn’t come from reading a book. Leadership requires humility, the knowledge that there are people who know more than you. I want to surround myself with people who have different outlooks, who disagree with me, because those people make you stronger." The Greitens Group is in St. Louis’ central west end, two blocks from its namesake’s home. He’s in a barebones office at the corner of the ground-floor. There’s a conference table extending from his faux darkwood desk, his briefcase, a legal pad, and telephone. "We had Mark Owen, the [pseudonymous] guy who wrote the book about killing bin Laden, last year," the voice at the other end of the line says. That’s Andrew Hauptman, owner of the Chicago Fire Soccer Club. The team finished second to last in the MLS East last year and is looking to rebound after overhauling the front office and shipping off half its players. Greitens takes careful notes and asks probing questions about everything from office culture to team leadership. "The captain’s name is Jeff Larentowicz? So you have the Jewish Navy SEAL talking to the one Jewish soccer captain. This is perfect," he says. After forty-five minutes, Greitens has all he needs to deliver a speech. He spends an inordinate amount of time tailoring his message to the audience. He won’t recycle the 2013 speech he gave to the then-defending Super Bowl champion Baltimore Ravens. A losing team in a rebuilding year doesn’t need a "rah-rah-go-get-em" message; it needs a lesson in self-sacrifice and leadership to avoid the temptation to give up. Greitens’ philosophy defies the left-right paradigm of modern politics. His principles are rooted in Seneca and Cato, rather than Buckley or Von Mises. The biggest breakdown in modern life, he says, is the perversion of the Declaration’s "pursuit of happiness" doctrine. Big government confuses comfort with happiness. It relies on entitlement and subsidy to please citizens, robbing them of the pursuit where real happiness lies. "It’s really easy to give people things. It’s much harder to build a system that gives people their purpose back," Greitens says. "The victim culture tells you that life should be free of pain. But you can’t get stronger unless you experience pain. When we truly care about people we push them." Greitens never brings up taxpayers, the "47 percent," or redistribution when he talks about entitlements. He focuses solely on the recipients of government largesse because "we have to offer a hopeful alternative based on results, rather than good intentions." When he left the Navy, he didn’t begrudge the VA or the Social Security Disability Trust Fund for going over-budget. He took issue with their insistence that he couldn’t be a productive member of society. The chlorine bomb left his lungs in disrepair and military doctors told him he was entitled to a lifetime of government checks as long as he didn’t work. Greitens didn’t feel disabled and, having witnessed PTSD firsthand aiding Bosnian and Rwandan refugees, dismissed the doctor’s insistence that thinking about his war experience was a sign of trouble. When his lungs wouldn’t cooperate with his will, he jogged until they stopped hurting. "They lure you into the system and people get stuck there. Even if you’re only 40 percent disabled, they’ll give you 100 percent disability in some cases," he says. "You have to think about the incentives of government workers. Guys in the VA don’t get paid to help veterans lead productive lives. Their metrics are on how many people sign up for benefits." One percent of the U.S. population fought in Iraq and Afghanistan. About half of those soldiers claim some form of disability, straining the VA system and preventing veterans from returning to the workforce and society at large. Greitens sees this as wasted talent. "These are motivated individuals who have the best training in the country. We entrusted them with protecting us, but when they come home we treat them like victims instead of leaders," he says. "Life is richer if it is animated by purpose. I wanted to reinforce that sense of dignity." Greitens visited injured soldiers at Bethesda Naval Hospital when he returned stateside. No matter the injury, nearly all of them said they wanted to return to their units to continue the fight. That visit coincided with news that Lt. Travis Manion, a MiTT Marine who relieved Greitens from his rooftop post following the chlorine attack, was killed in action. Greitens and Poudrier visited Travis’ parents, retired Marine Col. Tom Manion and his wife Janet, at their Pennsylvania home. They related Lt. Manion’s combat heroics as well as his commitment to Iraqis and the Marines under his command. Janet sat outside with Greitens discussing how she wanted to do something for returning veterans to preserve Travis’ legacy. A movement was launched on the porch that evening. Greitens left Pennsylvania and returned to his native St. Louis with the idea that he could help wounded veterans serve in their communities even if they couldn’t return to the battlefield. He and two friends pooled their combat pay to create The Mission Continues (TMC). Janet Manion, who succumbed to cancer in 2012, asked well-wishers to contribute money to a foundation in Travis’ honor. Within months she had hundreds of thousands of dollars and used the largesse to finance TMC fellowships. "My wife and I wanted to help struggling veterans, the families of the fallen, and help to create the next generation of leaders … Eric’s fellowship fit right in," Col. Manion says. "Eric certainly is a guy that had a vision, knew what he wanted to do, and was very driven, very articulate, and very compassionate. From the start it was a close connection." TMC awards $15,000 fellowships to cover the costs of employing veterans at community and national charities for six months. The fellow is in charge of picking his service group and arranging the position, so he has a stake in his own service. More than 1,400 have accepted the challenge since TMC opened. It cycles through 400 fellows per year, up from three in 2007, and may be the only organization in the United States to win a Manhattan Institute award while partnering with the Clinton Global Initiative. Chris Marvin was in his third year of recovery from a Blackhawk helicopter crash when he first heard about the program on NPR. Marvin contacted TMC through the station and became the group’s first fellow. He distilled Greitens’ ethos into TMC’s motto: "it’s not a charity, it’s a challenge." "I’d never found satisfaction with the baseball tickets, cash, and outdoor activities people tried to give you as a wounded veteran. I was looking for a renewed sense of purpose," Marvin says. Marvin finished his fellowship, got an MBA from Wharton, and founded Got Your 6, a non-profit aimed at closing the civilian-military divide by encouraging Hollywood to portray veterans as human beings, rather than Super Heroes or, worse, victims. If you saw American Sniper, you’ve seen Marvin’s influence at work. Greitens is most proud of the dozens of successful and innovative organizations started by TMC alumni. "We’ve created a generation of other leaders … it’s been so cool to see them develop," Greitens says. "We have fellows that have created non-profits, small businesses, and innovated programs in Fortune 500 companies and major foundations. I’ve only played a small part." Marvin says Greitens is being too humble: "The entire veterans empowerment movement started with The Mission Continues." TMC’s office sits in between a Purina pet food factory and a brewery. It smells like cat food or delicious Budweiser hops depending on the wind pattern. Visitors are greeted by five cinderblocks spraypainted with the organization’s core values (Respect, Trust, Learn and Grow, Work Hard, Have Fun), and Meredith Knopp, a St. Louis native and former Army MP who runs operations. "I started my own veterans initiative, H.E.R.O.E.S Care, but then I heard about [Greitens] … From the first conversation I saw his spirit, just this honor and drive to do something that no one was doing. I saw incredible energy and a challenge," she says. "He recognized that we’re not dealing in things—we’re dealing in lives." Revenue rose from $900,000 in 2009 to $7 million last year. TMC employs more than 40 people, half of whom are veterans, in four cities. Greitens left the organization in 2014, though he remains the board chairman, and entrusted Knopp with his vision of expanding beyond the fellowships. The Mission Continues now sponsors Service Platoons in 40 cities across the country to get veterans involved in community service. The effort is less than a year old and already has more than 4,000 veteran volunteers, which has had a multiplier effect on participation. "These veterans are young, mostly between 24 and 30, and have a lot to give. They’re bringing in thousands more from their friends and family. Every time a veteran interacts with these civilians, it breaks down barriers," Knopp says. Greitens wants to demolish the civilian-military gap in America by holding veterans accountable for their lives. The post-9/11 generation doesn’t spit on returning soldiers like our Vietnam Era forbearers. We are much crueler: today’s self-conscious civilians are too eager to cater to a veteran’s every need even if it’s self-destructive. ‘ Serve anymore,’" Greitens writes to his friend in Resilience. "Maybe they want to express thanks, and think that letting you off the hooks is a way to do that. (That happens more and more in a country in which soldiers and civilians are increasingly strangers to one another). It comes from a place of kindness. But it’s a kind of poison. Don’t drink it." Greitens will begin travelling the state on book tour in two weeks, evangelizing his doctrine of renewal and self-reliance and meeting the constituents he hopes will put him in the governor’s mansion. The primary is August 2016. Update 1:25 P.M.: An earlier version of this article misspelled the name of Gregg Favre, and incorrectly described him as the head of the St. Louis Fire Department's Special Operations Division. He is the head of the Department's Homeland Security Division. This entry was posted in Politics and tagged Feature, Military. Bookmark the permalink.